If you sign up for the blog you get access to lots of activities and print-ables to go with many of the books in files called “Fold&Learn”. Click the Five In A Row link here. 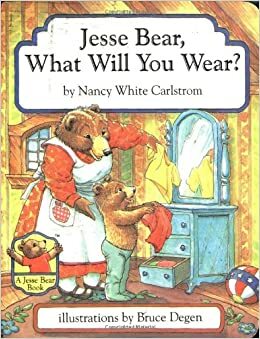 We recently finished our first book, “Jesse Bear, What Will You Wear?” by Nancy White Carlstrom. We were lucky enough to find it at our local library. Our library also had an audio cassette tape recording of the book that we could listen to in the minivan (the only cassette tape deck available to us, lol). Then we made a coordinating play scene. The kids used the play scene with their paper bears while we read the story and they both really enjoyed it. 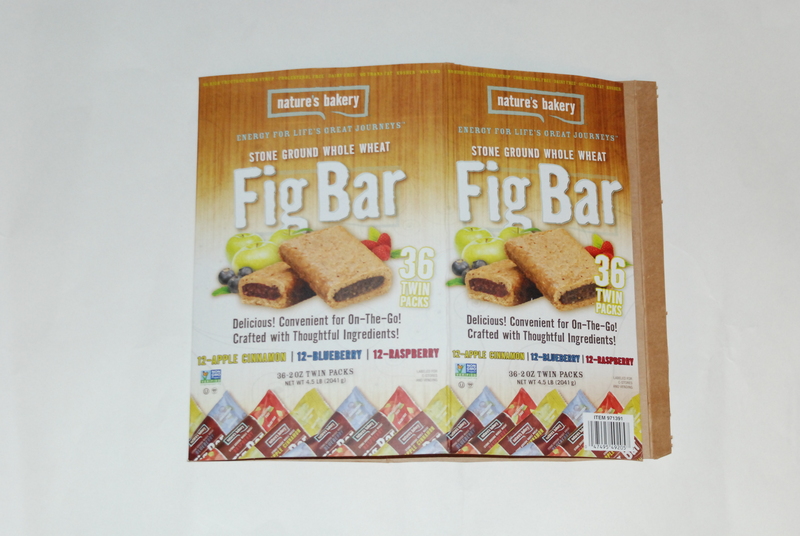 Here’s how we made the play scene. 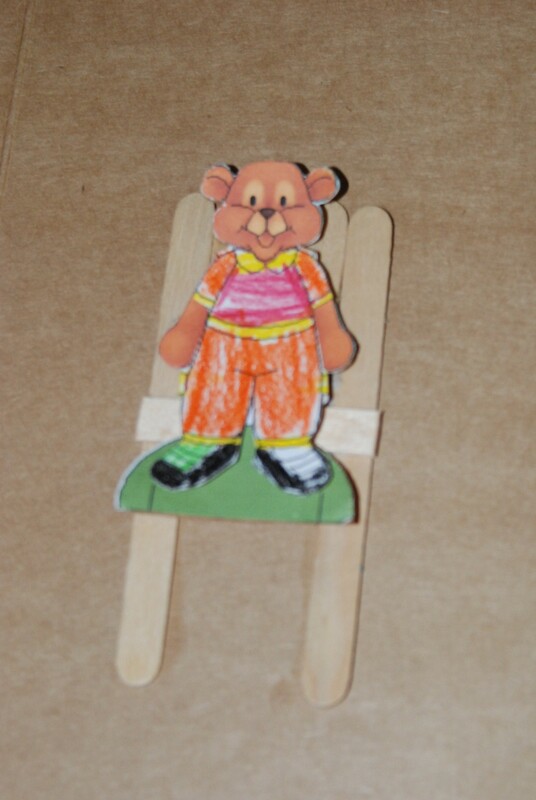 Step 2: Build your favorite parts of the story with Popsicle sticks. We made a sand box, a chair, and a bed. Step 3: Embellish what you built. 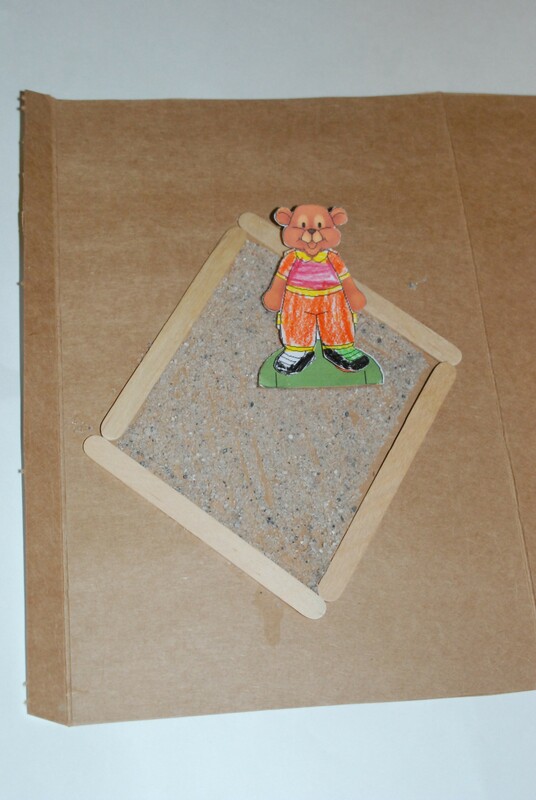 We glued real sand into our sandbox. 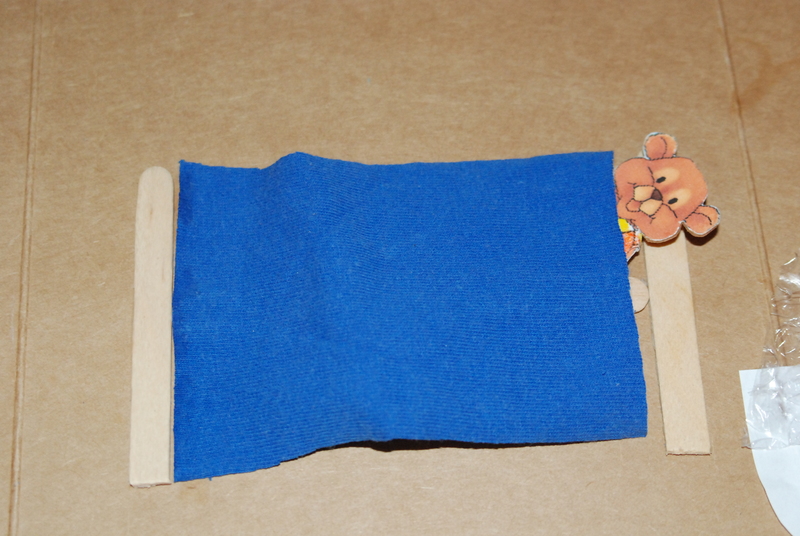 We used an old t-shirt to make a blanket for our bed and put glue just along the bottom edge so we could tuck our bears in for bedtime. Step 4: I cut a bathtub shape out of white paper and glued it to the cardboard just along the sides and bottom edge, leaving the top edge unglued. By leaving the top edge unglued you can pop your little bear in for a bath. 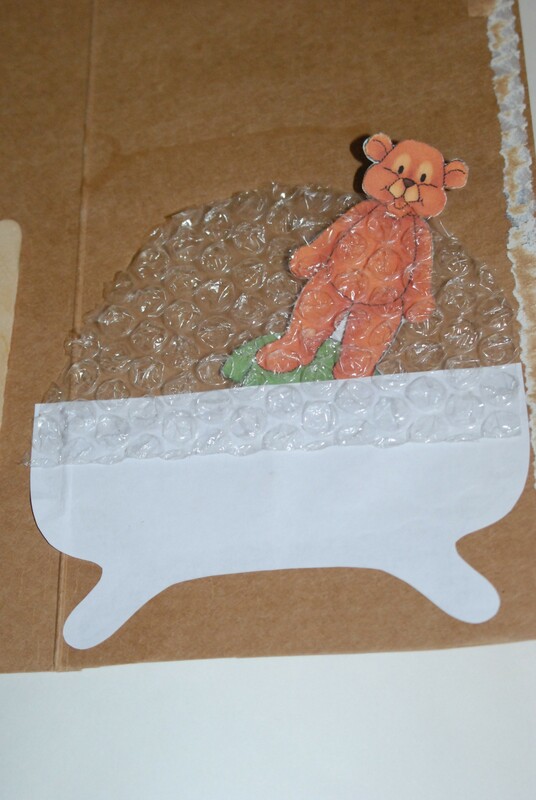 I added a big mound shape of bubble wrap to the top of the tub. I glued the bottom edge of the bubble wrap to the top edge of the tub. 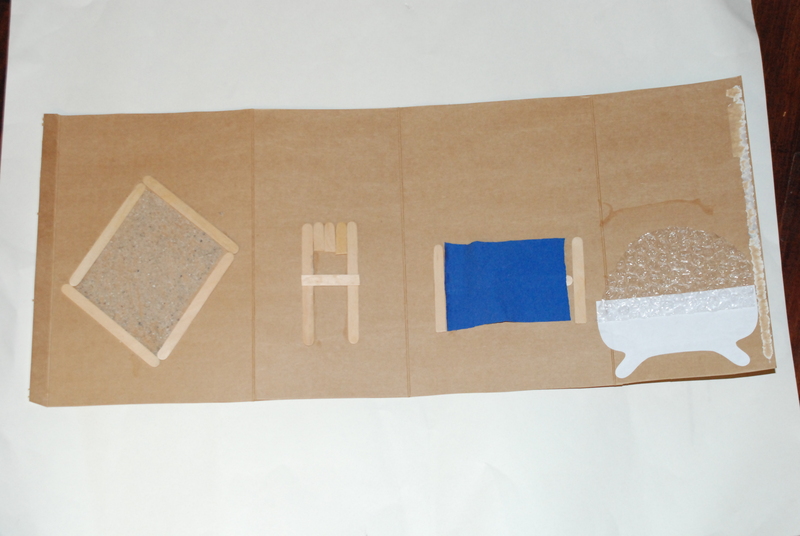 Step 5: Fold your play set in half to store it next to the book on the bookshelf.